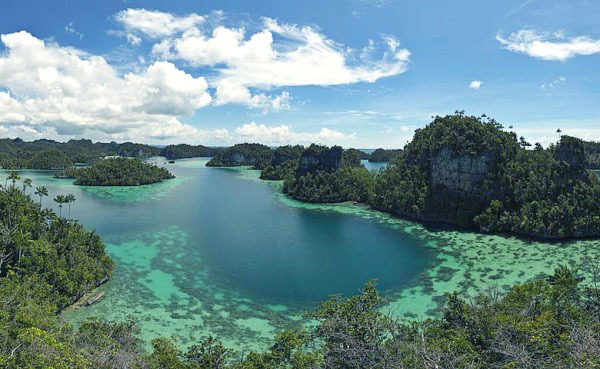 Raja Ampat Regency is famous for its stunning nature, including the islands and beaches. Both locals and foreigners acknowledge it! When it comes to island hopping, there is a recommended choice like Misool. Apart from being one of the biggest islands in Raja Ampat, it offers numerous options of nature attractions. The location is in the bird’s head part of West Papua Province. Not to mention it is located near to other attractions like Sorong City and nearby small isles. Today, Misool becomes tourists’ choice, especially to enjoy both nautical and land beauty. Being one of 4 biggest islands of Raja Ampat Regency, Misool features lots of nature attractions. Still, the most beautiful one is the formation of the coral reefs, where many beautiful fishes live. Not to mention the island features a wide open sea, so visitors have an opportunity to witness majestic sea creatures like whales and octopuses. What’s more? The island features crystal clear water with its corals. No wonder, people keep coming to Misool for doing snorkeling and other fun water sports. It is a no brainer. Most travelers come to Misool Island for some fun activities like snorkeling and sightseeing. However, the island also holds a pre-historic value. The locals even consider it mysterious and unique. At night, some octopuses are seen in the sea. Due to this reason, tourists need to carry a flashlight, so they can witness those beautiful creatures. On the other hand, the whales only appear in the sea during the bright day or at noon. It is also believed some rare fishes living there. Apart from witnessing sea creatures, the next popular activity is diving! Even though tourists are able to dive anytime, there are some worst times to explore the sea. It is between May and September, as the rainfall is quite troublesome. Due to such harsh weather, diving is not quite recommended for everyone. As an alternative, tourists can enjoy a comfortable activity like beach walking and caving. The fact is that some parts of Misool Island are covered by mangroves. All of them are stunning, indeed. Another thing to do in Misool Island is caving or cave exploration. It is true the island becomes the home of pre-historic caves. Most of them are located in Tomolol, holding breathtaking wall paintings. For those who love history, this is going to be an interesting adventure. Apart from the cave, the island also holds several ancient tombstones and carvings! At the end of the tour, travelers can rent a speedboat and visit nearby islands. All of these activities would be worth thousands of experiences, for sure. From Jakarta, travelers can take an airplane to reach Sorong City and the destination is Domine Eduard Osok Airport. From there, they need to head to Sorong Port and take a ferry to Misool Island. It is the only way to reach such tourist spot, after all. Despite the long trip, no one would get disappointed visiting Misool.